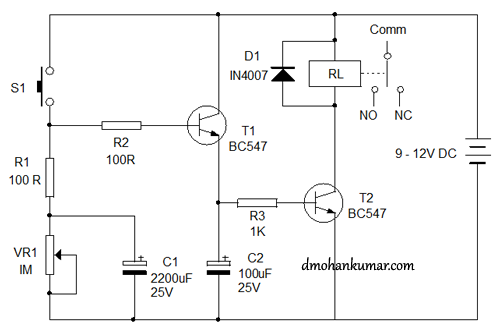 You can make this Transistor timer easily for driving a relay for few seconds to few minutes. It is too simple and uses only two transistors and few other passive components. Just press on the switch to start relay and after the time ends, relay will switch off. You can also set the time using a Trimpot. Working of the circuit is too simple. It is based on the charging/ discharging of a Timing capacitor C1. When S1 is pressed few seconds, T1 conducts followed by the triggering of T2. Relay then energize and remains as such till T2 and T1 switches off. When S1 is pressed, C1 charges via R1 to full voltage. When S1 is released, C1 starts to discharge through VR1 depending on the setting of VR1 resistance. High resistance, more time for discharge. Transistor T1 will be conducting till the voltage from C1 drops below 0.6 volts. The relay will remain energized depending on the time used for discharging the capacitor. Capacitor C2 is added for the clean switching of relay to avoid relay clicking. It also gives some time delay along with C1. Use 6 volt 100 Ohms PCB relay.